Experience: Everlyne has a wealth of experience in Finance and Audit spanning over 15 years in the private and public sector. Everlyne Orenge is the Manager Internal Audit and Risk Assurance department and is responsible for providing independent and objective assurance to the adequacy and effectiveness of the internal control systems. She has a wealth of experience in Finance and Audit spanning over 15 years in the private and public sector. She started her career as an accountant at the Kenya Tea Development Agency (KTDA). 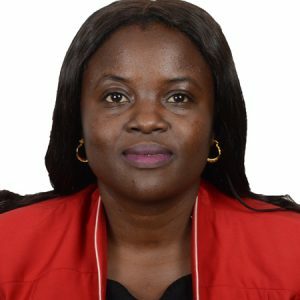 She later moved to Ernst & Young and the Kenya Rural Roads Authority (KeRRA) where she worked as a Senior Auditor and Regional Accountant respectively. Prior to joining The Commission in 2018, she was the Chief Internal Auditor at the Judiciary. Evelyne holds a Master of Business Administration (Finance) from the University of Nairobi and a Bachelor of Commerce (Finance) from the same University. She is a Certified Public Accountant, a member of the Institute of Certified Public Accountant of Kenya(ICPAK) and the Institute of Internal Auditors(IIA).